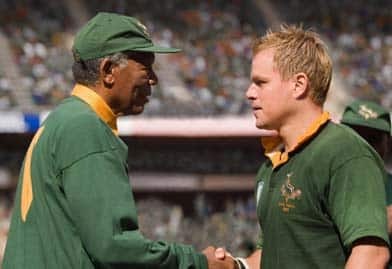 Invictus is a great premise for a movie: the rugby game that helped unify post-apartheid South Africa. But I have to say that I was a little thrown by the accents. Matt Damon, who plays the rugby team captain, has nailed the South African sound. But Morgan Freeman sounds like, well, Morgan Freeman. That’s not good because he’s supposed to be Nelson Mandela. In every other way he appears to be. But without the accent, it’s just not complete. Morgan Freeman and Matt Damon in Invictus. Maybe I’m being overly critical, but it seems I’m not alone in demanding our best actors make their characters more authentic by mastering these regional dialects. Voice coaches say actors are increasingly expected to know not only standardized accents, such as American and British, but regional ones as well. Think Leonardo DiCaprio’s Boston diction in The Departed; or the 1930s New York tones in the recent biopic Amelia or Cinderella Man. All this accentuation of accents means more pressure on dialect coaches. “I have more responsibility than my predecessors,” says Eric Armstrong, voice coach and associate professor of theatre at York University. Armstrong has taught about 50 accents over the 15 years he’s coached actors, including the cast of CBC TV’s The Border, English actor Tom Wilkinson of Michael Clayton fame, and Dora-nominated stage actors. He says it’s not just a standard American accent that actors are expected to know but New York, Pittsburgh and Southern Illinois. Nor is it just African, but Ghanaian and Somali; not only Asian but Japanese, Chinese and Korean. Our attention to regionalisms is partly because we’re hearing more original accents in films. But more significantly, it flows from the steady diet of accents we take in through daily media consumption, travel, and living in increasingly multicultural societies. Diane Pitblado, the voice coach to the stars, says the growing pressure on actors to adopt accents may go back to a single source: Meryl Streep. 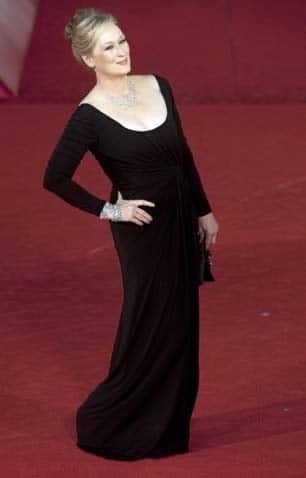 Meryl Streep, lifetime achievement award in Rome, Oct. 2009. From Sophie’s Choice to Out of Africa, Evil Angels and the recent Julie and Julia, Streep proved it could be done and encouraged actors to be brave and do it as well. Pitblado says audiences should demand their actors sound spot on. She was brought in to coach Hilary Swank, Richard Gere and the rest of the gang in Amelia. But she says the movie makers originally questioned whether to adopt accents, whether audiences wanted to wade through such a different sound. Her take was: you’ve got the hats, the clothes, the sets, how can you not speak as if you’re from that place and time? There are, of course, multiple challenges in getting actors to sound like they’re from a different place and time. For one, actors have to get used to distinguishing different sounds, something called phonemic awareness. As Eric Armstrong points out, sometimes a vowel sound in one accent is split into two sounds in another accent. Take the word hot dog. In a New York accent, the o in hot is different than the o in dog. So it becomes haht dooawg. Try it. Lips forward. Say hot dog. Now keep that up through an entire script. Not so easy, is it? Another challenge in teaching regional accents is when the actor is dealing with a completely foreign tongue. Say a Chinese actor wants to do a number of Asian accents, which is becoming more common. But say that actor is second generation Canadian and doesn’t speak fluent Mandarin. And then there are the accents that are just not that common, such as, say, New Orleans Creole. Or an accent that’s a blend of different regions like Amelia Earhart’s. Earhart was from Kansas but lived in New York high society, so she was kind of like a blend of Dorothy from the Wizard of Oz and Katharine Hepburn. When dialect coaches need help, they can phone librarians in small towns or resort to the online International Dialects of English Archive at the University of Kansas, which offers audio samples of voices from Cameroon to Kuwait to Colombia. But what if, after all that research and coaching, an actor just doesn’t get it? Obviously it’s disappointing to the dialect coach. But it’s the audience that really suffers. Sure, not every actor is a Meryl Streep. But if you make a living impersonating other people, it’s your duty to be as authentic as possible — right down to the last vowel.